When it comes to your soccer career (whether that be as a player, coach, scout, or private instructor), you may think that your performance speaks for itself. That is only true if you let it be. The trouble is that job openings in soccer tend to be rare. Competition for spots on player rosters is extremely fierce. Scouting and coaching positions are more abundant (with the U.S. Bureau of Labor Statistics projecting a healthier job outlook in this field compared to other industries), yet still are few and far between at the highest levels. Your play or your results can only go so far in getting you noticed. Being able to demonstrate them through a well-written resume can bolster your chances at securing employment. Included here are several soccer resume templates that can help you grow your career opportunities in the sport. Think of the templates shown here as roadmaps to help you along on your journey toward landing your dream job in soccer. Those with many years of experience in soccer may want to show that experience through a chronological resume, while those just getting into the business may want to emphasize their qualifications with a functional resume. If you have the ideal mix of experience and skills, you can share it using combination soccer resume templates that show your professional timeline while also detailing all of your relevant skills and qualifications. Sometimes it is difficult to know exactly what style of resume would work best with a prospective employer. In these cases, it’s typically best to go with the most popular templates available to you. A template’s popularity is typically gauged by usage. Templates designed by professional resume experts using tried and true techniques are typically downloaded the most. The temptation when writing a resume is to inundate employers with as much information as possible. 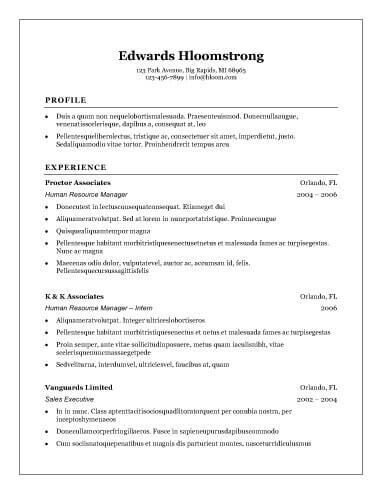 A one-page resume template will help you avoid this mistake. It will show you how to prioritize the information you have to share properly, identifying what is most important and what you can exclude. The space provided will then assist you in condensing it all to a single page. If you are new to resume writing, it may be best to begin by referencing traditional soccer resume templates. These follow a format that emphasizes organizing your information in the correct sequence. This style of resume offers a clear, no-frills look at your career, perfect for employers whose main objective is understanding your accomplishments. Their focus will be on your resume’s content rather than its method of formatting. When applying for coaching or scouting positions, employers want to see that you have an appreciation for details. You convey such an appreciation when you utilize contemporary soccer resume templates when creating your employment reference document. 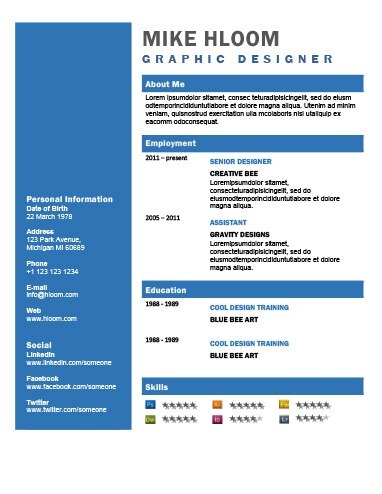 These focus on the minute elements that make a resume more dynamic, such as the content layout and header formatting. Added attention to these small details greatly enhances the overall effectiveness of the document. List only those points of contact that you would want an employer to use when reaching out to you. Avoid using personal email accounts with unprofessional addresses (e.g., “[email protected]”). Research the customs when applying for jobs in foreign countries to see if it is appropriate to include information such as your age, marital status, etc. A stated objective to your job search is typically only required when you are seeking a significant career change (e.g., going from a player to a coach). Include only high-level details of your skills and experience in your summary statement. Be clear in how you (and your skill set) can offer added value to an organization. Tailor your skills to the position you are applying for. List skills applicable to performance if applying for a player opening, or leadership if seeking a coaching or management position. Soft skills, such as working well within a team or being coachable, are important but should not dominate your skills section. When listing specific skills and attributes, make sure that they are verifiable (either via demonstration or through references). Include detailed metrics whenever possible when listing your career achievements (e.g., minutes played, wins and losses, number of players evaluated). Do not go back further than 20 years when listing previous experience. TheMuse.com recommends accounting for serial job hopping (which can be common in sports). If you were only in a position for a small amount of time, explain your reasons for leaving. Do not include information about a school from which you did not matriculate. Job experience related to a school (e.g., coached girls high school team) belongs in the previous section. Information such as GPA and courses studied, while relevant for other careers, is typically not needed when applying for jobs in soccer. Above all, our resume builder helps build your own confidence in your document and its ability to help increase your chances of getting noticed.